Today is May 4th, hence “May the fourth be with you” aka “Star Wars Day.” Now I wouldn’t be a geek without bringing some attention to this, but I want to draw a clear distinction here. I have watched all the Star Wars movies, I enjoyed them, even the ones with Jar Jar Binks. I have memorized many lines, but I’m not super sold that it is the all to end all of SciFi. I have read a few dozen of the books, I’m an avid reader so I was bound to read several. Most are short enough I can knock out a couple a day even on my current schedule. Some of the books are great, some are terrible. I’ve also play a LOT of Star Wars games. Again, some are great and some make you want to stab out your eyes with a light saber. I can watch Star Wars followed by Lord of the Rings and Star Trek and not feel bad in any way. I don’t own any Star Wars toys, but if I did I’d probably be happy playing with them isntead of leaving them sealed in their containers. I’d have epic fights with ThunderCats, GI Joes, and Transformers. Imagine Vader, StarScream (I never had MegaTron because he just turned into a gun and that was kinda lame compared to a jet), Mumm-Ra, and Cobra Commander lined up on one side, and Han Solo (Luke was such a whiner), Optimus Prime, Lion-O, and Duke on the other plus all the lesser characters and green and tan army men (the green are the good guys). It would start out with the baddies winning, but then they would start fighting each other and Optimus Prime would try to sacrifice himself (he really enjoys doing that), but then Han would fly in with the Millennium Falcon to save him as Chewie yells. 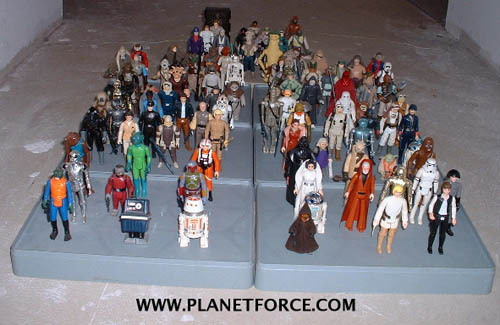 Some of the Joes would lose their arms or legs (they are detachable after all), C3-PO probably wouldn’t make it and Jar Jar dies very early, probably in the first attack, but in the end the good guys would win the day. Now pardon me while I go check ebay for some cool new toys, I have a battle to plan.